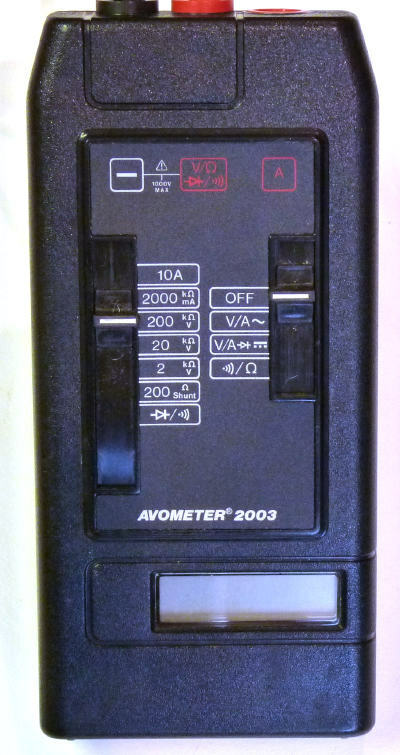 Digital battery powered Avometer model 2003 made by Thorn EMI Instruments in Dover, England in March 1986. The multimeter has a clear digital readout on a 45mm X 10mm LCD screen. It will measure AC and DC voltage and current as well as resistance and continuity. Function and range adjustment is accomplished via two slide switches, The instrument emits a warning sound if the the switches are set incorrectly. The instrument is protected by two fuses (2A and 10A) and powered by a 9 Volt PP3 size battery. date of manufacture March 1986. I discovered that the main problem was that the switches were making poor contact which was resolved with the aid of switch cleaning fluid. This was not without some difficulty as there are also gold plated printed contacts on the rear of the printed circuit board. When I re-assembled the board I found that some of the segments on the LCD panel were not working, so had to take it all apart again an clean the LCD connectors as well. Now working correctly and accurately on ohms and voltage ranges. 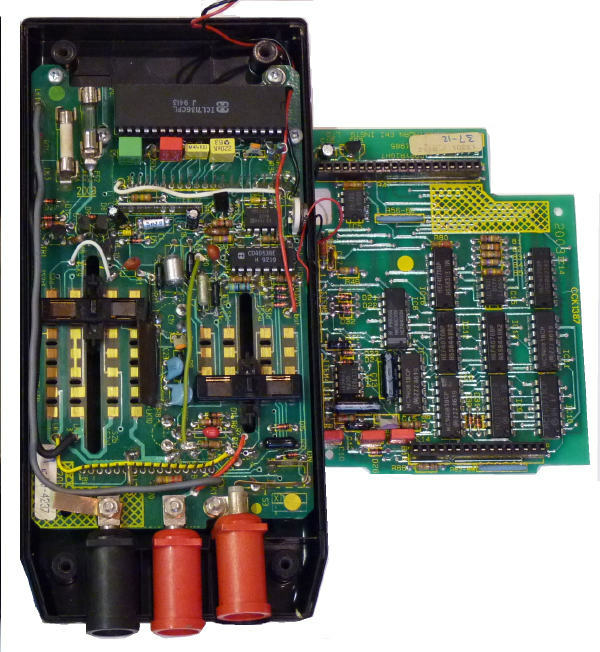 This is a view of the inside, the two printed circuit boards are connected together via two multi pin connectors and the range change switches form part of the left hand circuit board which is attached to the front panel. This meter was given to me by Rupert Russell who said it was bought by Cosworth engineering in 1986 to aid servicing the Sierra's but it drove them a bit mad when some internal fuse blew and it had to go back to the maker to mend, twice, as the 1st time the repair failed! The other thing about it that was kind of disappointing was the max volts being 200, so it was unable to record mains volts..! But as home race car diagnostic tool it had been great and reliable, until he tried to calibrate a displacement sensor recently, and the correlation between the 20 and 2 range was too great to inspire confidence, so has been superseded by something from Maplins. James Knox has one that his late father in law acquired shortly after he bought his 1985 registered Ford Scorpio. As an engineer he was able to secure a ‘breakout box’ kit an early forerunner to the kind of plug-in diagnostic tool used today. Essentially the breakout box acted as some sort of interface device where various components of the car engine could be connected via the break-out box ad then using the AVO meter, the value ranges could be read and checked against the expected values, deviation pointing to some fault or another. The workshop manuals clearly show this meter amongst other brands so I can only assume that it was one of the referred devices. I have not been able to find any information about this instrument, so perhaps it only had a short production run? Do you know anything about the DA 2003? 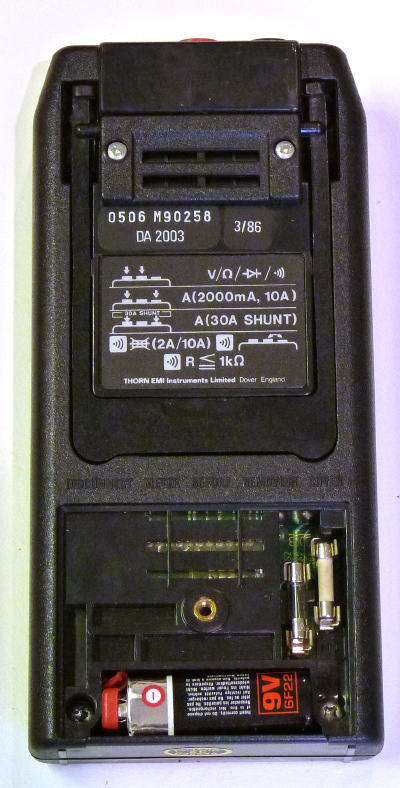 Some digital meters were made by Gossen Metrawatt and re-badged for AVO, though in this case the circuit boards and the casing indicate manufacture in Dover.